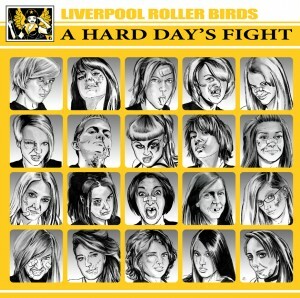 A couple of weeks back I was contacted by the Liverpool Roller Birds who wanted a design to promote their upcoming roller derby matches. The event itself is called ‘A Hard Day’s Fight’ and the thought of not using the design from the Beatles album ‘A Hard Day’s Night’ as a starting point seemed criminal. So having the concept approved I proceeded to illustrate all twenty members of the group all with the hallmarks of a successful roller derby. So we have the poster with all the information for the derby and more in keeping with the original album is the T-Shirt design. I must point out that the Liverpool Roller Birds logo was supplied to me as you see it and I have no idea who designed and illustrated it for them? 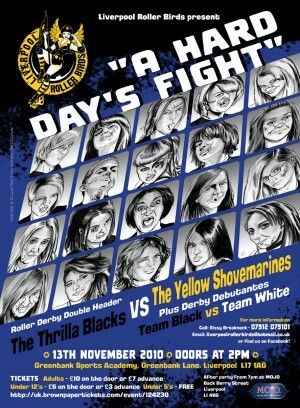 If you are in the area on the 13th November make sure you drop by and catch the action.